Russia and Turkey appear so far to have successfully shielded their strong relations from potentially damaging disputes over the crises in Syria and Ukraine. Turkish President Recep Tayyip Erdogan on Monday will hold talks in Ankara with his Russian counterpart Vladimir Putin to tighten links which have survived potentially grave disputes over the Syria and Ukraine crises. The talks are expected to focus on energy cooperation — with Ankara seeking not only a reduction in gas prices from Russia but also greater import volumes ahead of the winter — as well key diplomatic issues. 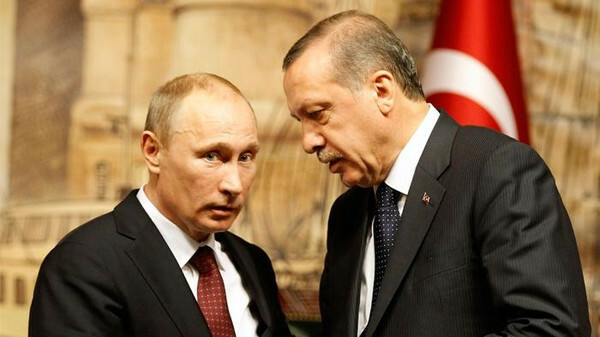 It will be the first time the pair have met face-to-face since Erdogan moved from the post of prime minister to president in August, the same job change that Putin himself made in 2012. Commentators often note the similarities between Erdogan, 60, and Putin, 62, charismatic strongmen who are both accused abroad of authoritarianism but retain significant support bases at home. Ankara — a strong supporter of the territorial integrity of states due to its own battle with Kurdish separatists — opposed Russia’s annexation of Crimea from Ukraine this year. It is also worried about the situation on the Black Sea peninsula of the Turkic Crimean Tatar minority who, according to activists, are the victims of persecution by the new pro-Kremlin authorities. Meanwhile, the two countries are at odds over the Syria conflict, with Putin the last remaining major ally of President Bashar al-Assad but Erdogan pressing for the Syrian leader to be ousted without delay. But these disputes appear not to have harmed other aspects of cooperation, with more than four million Russian tourists visiting Turkey annually and Russia building Turkey’s first nuclear power plant in a $20 billion project. “Turkey-Russia relations remain stable, maintaining continuity and not depending on the current situation,” Putin said in an interview with Turkey’s Anatolia news agency ahead of his visit. Turkey — the second largest European importer of Russian gas after Germany — wants cheaper but more gas from Russia especially in the current winter season. Energy Minister Taner Yildiz noted on a visit to Moscow last week that in some Turkish regions 22 times more gas is needed in winter than in summer. Gazprom had promised to increase deliveries this year to Turkey to 30 billion cubic meters of gas, up from 26.7 billion last year. However to the alarm of Ankara, the projected figure has now fallen due to the crisis in Ukraine, a key transit country. In a sign of the seriousness of the issue, Gazprom chief executive Alexei Miller on Saturday held unannounced talks in Istanbul with Yildiz and Erdogan, the Russian company said in a statement.